filmmakers whose work has been honored by the Academy of Motion Picture Arts & Sciences with an Oscar nomination. Undefeated is nominated in the Best Documentary Feature category. You can see it at DocuDay in both New York and Los Angeles. If you typically spend your leisure time watching documentaries, you might know Ed Cunningham as the producer of films such as King of Kong: A Fistful of Quarters. But if you typically watch ESPN, you might know Ed Cunningham as a former offensive lineman with the Arizona Cardinals and Seattle Seahawks, and for several years one of ESPN's on-air college football analysts. profile of teen magician competitions Make Believe (Dir. : J. Clay Tweel; Prod. : Steven Klein). And now Cunningham's professional worlds converge with the Oscar-nominated documentary Undefeated, directed by Dan Lindsay and TJ Martin and also produced by Rich Middlemas and Glen Zipper. Undefeated spends a season following the Manassas High School Tigers, a football team from inner-city Memphis, which, in its 110-year history, has never made it to a playoff game. But then six years ago, in walked volunteer coach Bill Courtney, who committed himself to working with these teens to change all that. 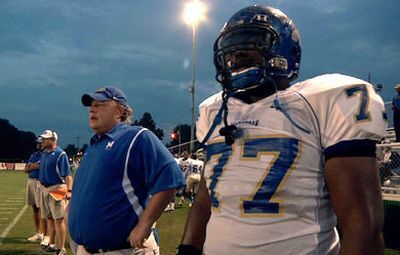 Coach Bill Courtney (center), featured in Dan Lindsay and TJ Martin's Undefeated, which opens in theater February 17 through The Weinstein Company. "I've always taken very seriously that I was lucky in that I was coached by a lot of really great men," Cunningham admits. "This is why Undefeated was such great project to be involved in; I had coaches like Bill Courtney. But I was lucky enough not to live in an environment like those guys [in the film] live in." When he speaks of their "environment," Cunningham is not just referring to economic circumstances. "Football in July and August is a hard sport in that heat down South," he notes. "Hopefully, you have people around the team like Coach Bill and the other volunteers to make sure you understand that this work is really not for this sport. Yeah, we're gonna be good. Yeah, we're gonna win. But this is for the rest of your life and how you conduct yourself as a man off the field." Gordon believes Cunningham's sports background has contributed to his producing work. "I think Ed has a natural leadership which comes literally from being on these teams," he explains. "Central to each of the films we've made is, he's able to help give [the project] that sense of pride and strength that comes from having played at the highest level in that sport. I think there's a real relationship with those skill sets." 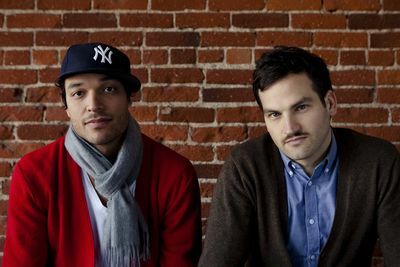 TJ Martin and Dan Lindsay, who had known Gordon for several years, along with co-producer Rich Middlemas, brought their idea for Undefeated to Gordon and Cunningham while still in the planning stages. The directors' previous, and only, documentary was Last Cup: The Road to the World Series of Beer Pong. normally think is a shallow story. Ed and I thought that if they'd have a deep piece of material, they'd really be able to tell a compelling tale." "Because I get my fill of sports with my ESPN job, I tend to like other things outside of that," Cunningham says. "We just got the sense that this would be more than just a high school football movie. 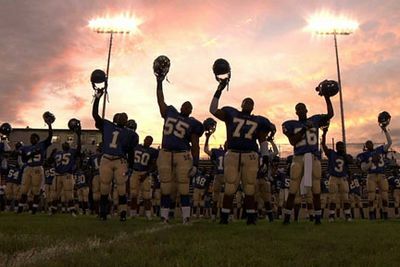 They wanted it to be like a Friday Night Lights or a Miracle, which is one of my all-time favorite sports movies. They showed us some test footage, and they knew who to follow; they knew where the stories were. It didn't take long for Seth and I to jump on board with them after that meeting." 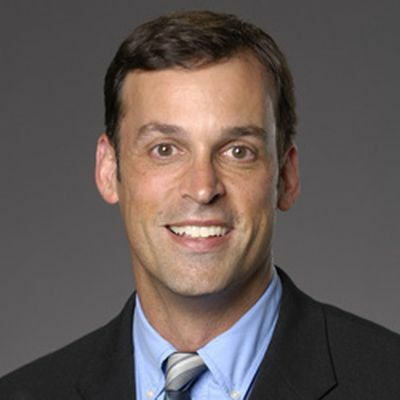 Producer Ed Cunningham, who is also a college football analyst for ESPN. Gordon and Cunningham first met while Gordon was editing a "scared straight" type project for the Marine Corps, directed by Greg Whiteley (who would direct New York Doll). Cunningham was hired to be the voiceover talent. Gordon describes how he and Cunningham work together. "I often play the role of supporting the directors in certain problems--in post, in restructuring. But when it comes to the heavy level--Ed's chops on the legal side and all that stuff--he's unrivaled. In the early stages, we're very hand-in-hand, thinking about the same kinds of things, and the deeper we get into the process, the more we start wearing our respective hats." as they began to work with them. "Ed managed and did so much in terms of the school board," Lindsay recalls. "Obviously that's a tricky thing; we wanted free and unfettered access to the school, and understandably the school board was a little hesitant to allow that to happen. It took a lot of producing work to convince that our intentions were pure and we weren't there to do some sort of exposé. We were there to just observe and show the truth of all these kids--to really tell the kids' story and the story of the football team. From a producer's standpoint, Ed had so much more knowledge and experience in that--especially on the legal side. I don't see how we could have ever pulled that off without him. in and say, 'You got it. That's right.' Especially as a football fan and former football player, we knew we had gotten a game right when Ed reacted to it." around college football is completely broken. I think the NFL is a money-making machine and is a pretty smart business. But for the players, it just stops being fun. It's almost like filmmaking; sometimes it's just about the business. The thing about filmmaking is that you can still be very artistic and unrestrained if you set up your career properly, or if you have some success that gives you that ability, but with football, you're playing for the man. I did get sick of the game by the time I left. things like that. Beyond that, though, for a lot of these young people, their hopes and dreams of an NFL career, the percentages are so small. What the film does a good job in showing is, yes, we need to push to keep sports in our schools, push to keep sports well funded and well coached, and make sure we're hiring the right people to do it. Because it's part of the whole experience. It's a part of growing up. And that's the conversation I'd like to see. Yeah, we should keep playing these sports. It's given me the life I have, but it is also important to the things that relate to [being] off the field. The truth is, not many people make it, but you also have the opportunity to use those skills in other parts of your life--before you have to step out into the real world." Undefeated opens February 17 in theaters around the country, through The Weinstein Company. also teaches cooking classes in Austin, Texas, and writes for The Criterion Collection as Chef du Cinema, pairing films and food.